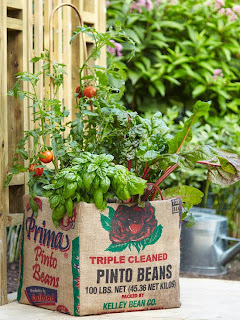 Salvage a cardboard box and two burlap bags (found at bulk grocers) for a mini garden. Cut the bags at the seams, piece together to fit your box, and sew with right sides together to form a tube. Turn, then fit over the box, tucking and gluing extra material inside and underneath. Line the box with a polypropylene bag, and add potting mix and plants. Wind chimes are a staple of many decks, porches, and patios. Create your own using nothing more than some empty wine bottles and aluminum wire. 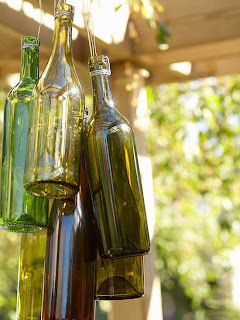 Hang a collection of different-size bottles at various heights from a pergola or other overhead structure. 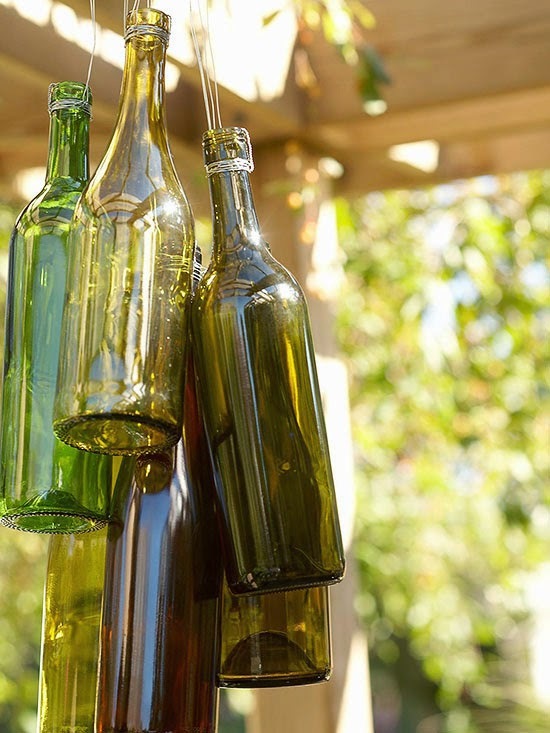 Listen as the bottles softly clink together with the wind. 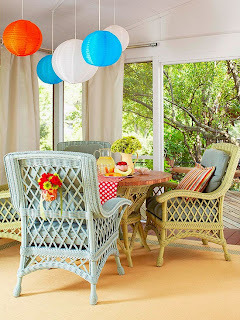 Wicker chairs are a staple in many outdoor gathering places. 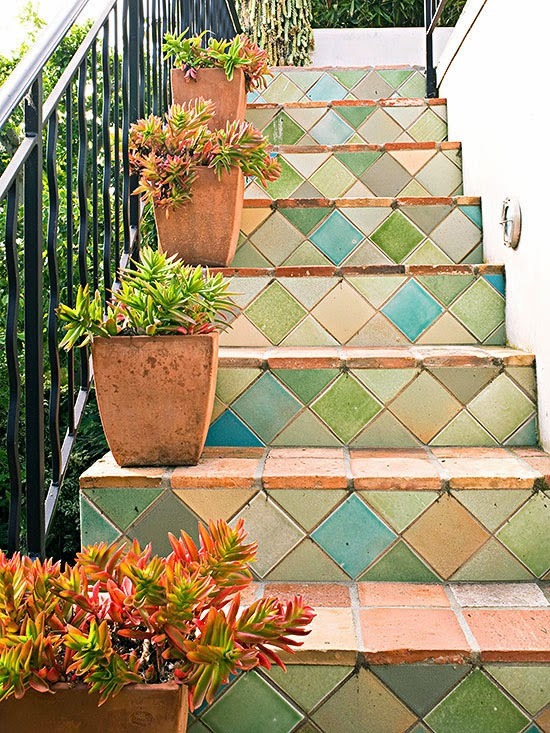 Breathe new life into yours by giving them a fresh coat of colorful paint. Choose pastel colors for a subtle look, or use brighter colors to make a bigger style statement. 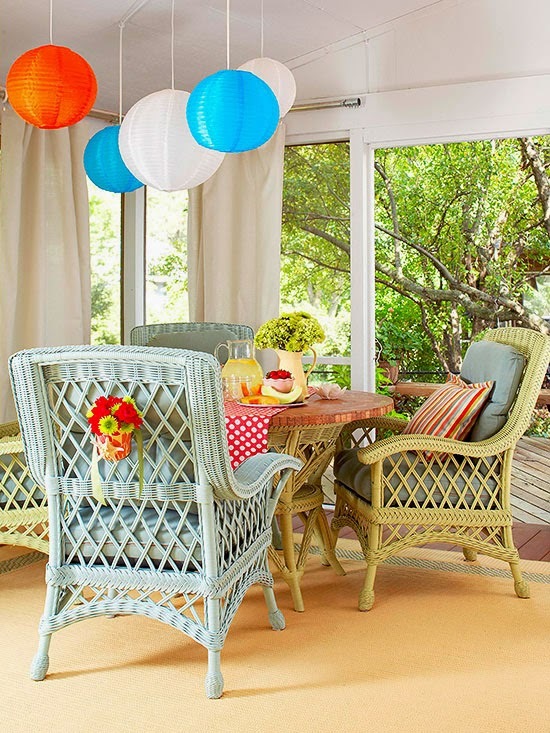 BONUS: add hanging lanterns to add seasonal color or just your favorite colors in general! 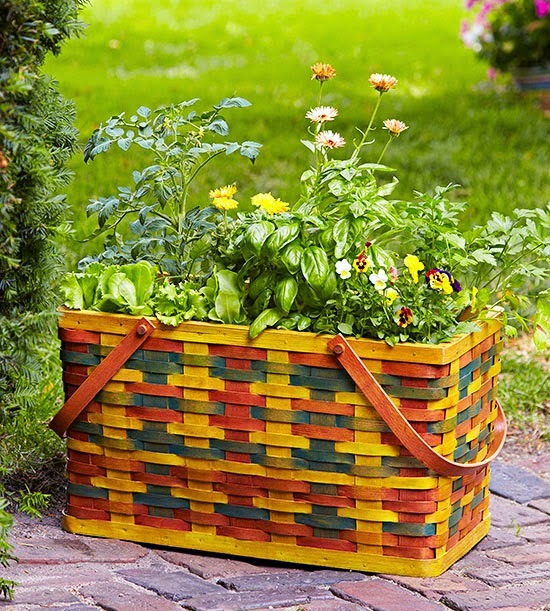 A large picnic basket holds a garden fit for feasts -- lettuce, bush tomato, basil, parsley, and edible flowers. Use a small brush and different colors of stain to create a plaid effect, then use a foam applicator to brush on a light coat of wood stain to unify and soften the colors. Before planting, line the basket with landscape fabric to hold the soil. Craft this stylish pallet table to add a personal touch to your outdoor space. Purchase two half pallets and attach them, one on top of the other, using wood screws. 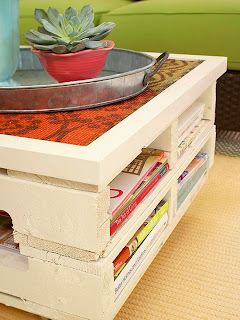 Cut a top and base to size out of medium-density fiberboard (MDF), and attach those pieces to the top and bottom of the pallets. Frame the top MDF piece with lattice strips, mitering the corners if desired. Paint the entire unit a color of your choice and let it dry. Attach casters to the bottom of the table to increase mobility. For an embellished top, cut an outdoor sisal rug to fit inside the top and attach with a weatherproof adhesive. 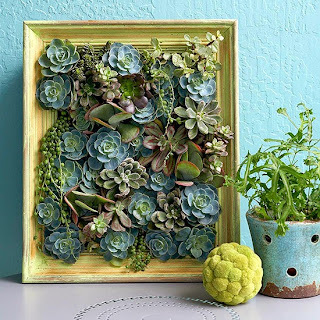 Create this artistic masterpiece using soil as a canvas, plants as paint, and a picture frame as a planter. Keep the price even lower by using an inexpensive flea market frame as your planter. Give the frame a fresh coat of paint if you're not a fan of the color. Fill the canvas with soil and tuck in plant varieties that will stay small, such as sedums and Echeveria. Colorful tiles affixed to these stair risers give the outdoor staircase personality and style. The pastel color palette enlivens the home's neutral exterior without looking too bold.